I’m sure you have heard how good and healthy homemade bone broth is for you. But, have you ever wondered how to make bone broth? Watch the video and follow the steps and you can do it too! I have shared with you the health benefits of bone broth, but you may be wondering how to make bone broth yourself. So, to take away all doubt, I am going to show you in the video which follows and give written instructions – it really is easy! You will actually be surprised at just how easy it is. 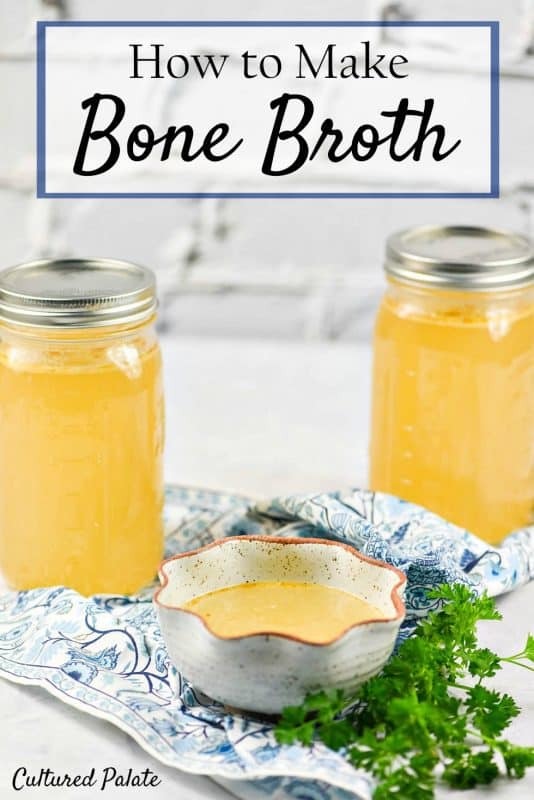 Using the crock pot, instant pot or a continuous pot method, each way is a breeze to make and you will enjoy homemade bone broth (that gels) with all its nutritious goodness! You know, like most things, homemade bone broth (beef or chicken) is not only more flavorful it is also packed with more nutrition and does not contain any unnecessary ingredients. You control what goes in it. But, there is more! Learning how to make bone broth is more economical than the store-bought version! After all, the only cost to you is the bones and some vegetables that you throw in! There is really only one important secret to making a nutrient-rich broth that gels. Are you sitting down? It’s the type of bones you use – they should be bones from grass-fed animals. Most animals are raised commercially under what is know as the confined animal feeding operations (or CAFO). This means that animals are fed an unnatural diet of grain that is not healthy for their intestinal makeup. They are also given a variety of veterinary drugs and growth promoters. Starting off with locally purchased (or raise your own) grass-fed animal’s bones, you will avoid these additives. Because, yes, they can affect your broth. What’s More, They Can Keep It From Gelling! 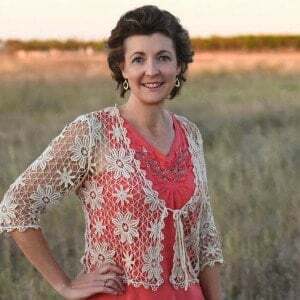 Sally Fallon author of Nourishing Traditions who also writes for the Weston A. Price Foundation pointed out that chickens raised in confined animal feeding operations (CAFOs) tend to produce stock that doesn’t gel – this gelatin has long been valued for its therapeutic properties. If you are like me, it always helps for someone to show you how it is done so, let’s get started! Half Gallon Wide Mouth Mason Jars – I love these and use them for all sorts of storage. From making kefir to storing broth to using my immersion blender in them for soups or kefir drinks – they are a staple for me! Wide Mouth Plastic Storage Lids – These are great when using mason jars for storage and they do not rust! Bragg Apple Cider Vinegar – I love this vinegar just remember to shake it because the “mother” is at the bottom! Being a probiotic food, apple cider vinegar is great for what ails you (see Master Tonic). It is definitely a great tool to have in your natural solutions toolbox! 5 Gallon Stock Pots – I love these and with a large family, use them daily for cooking, broth, and cheesemaking. 9×13 Glass Baking Dish – My purple baking dish is no longer available, but, it is just a pyrex glass dish. I also use a stainless baking dish to cook the bones – just use what you have! Learning how to make bone broth in your crock pot is fast and easy. Just put the bones using the ratio of 1 – 2 lbs of bones for every 1 gallon of water in the crockpot. Fill with water, add 2 Tbsp apple cider vinegar cook on low for 24 hours. Remember, you can’t rush an exquisite pot of stock – let it cook long and slow – simmering at least 24 hours. This makes sure you are leaching out the valuable minerals and nutrients from the bones. In the wintertime, I like to keep a perpetual soup pot going and I’ll tell you more about that below. In the summer, it puts too much heat into my kitchen to keep a pot of stock going all the time. So, I often use my roaster because it is larger than my crock pot. I read once the many of the great chefs actually keep a continuous stockpot of broth going around the clock. Being home most of the time, I have started doing this, especially during the winter months. Boy, is it ever convenient! I do this by keeping a 5-gallon stock pot on the back burner for broth. Once the bones are added, I bring it to a boil and then reduce it to simmer. As I dip broth out to use, I refill it with water. Each week, I take out the old bones and add fresh ones, bring it back to a boil and then simmer. In keeping a continuous stockpot of broth going, it is always interesting to see the bones becoming softer and softer. This just goes to show that the minerals and nutrients of the bones truly are leaching out into the broth. I mean, talk about proof that what we are doing is working! I normally add fresh bones weekly and when keeping a continuous stockpot of homemade bone broth going, I use 2 lbs of grass fed bones to each gallon of water. Place your bones in the Instant Pot. Add apple cider vinegar, and salt. If you are adding veggies, do it now. Add water until the pot is 2/3 full. Once the cooking is complete, press “Cancel” and then use the natural pressure release – you can also use the quick release method – either works. Strain the broth and pour it into jars. Store in the fridge. I have bones in the freezer from butchering our own steer. I realize this is not a viable option for many people but it is a good one if you have the land and resources. I have also purchased a variety of bones from a local grass-fed meat company. You can find local sources in your area at the Weston A. Price site. Find a chapter in your area, contact the leader and they will give you a list of local meat, dairy, and other products from your area. You can also search for grass-fed meat in your area to find local producers. If you cannot find a local source of grass-fed beef bones, I have been very pleased with my affiliate partner, US Wellness Meats. I have ordered from them several times and have been pleased not only with the quality but also the speed of delivery. Plus, not only do they offer beef, they also carry poultry, bison, lamb, rabbit, duck, and seafood. Since becoming aware of the benefits and nutrition of bone broth, our family has been having a cup of broth with breakfast each morning. It tastes delicious when seasoned with vegetables and sea salt. A cup of bone broth is also a great pick-me-up in the late afternoon (after a nap!). Many soup recipes use a beef, vegetable or chicken broth as the base. Whenever you see bullion cubes listed as an ingredient in a recipe, substitute beef bone broth. Simply replace the amount of liquid called for in the recipe with the broth. Beef Bone Broth can easily be used in browning meats or for adding liquid to recipes instead of water. Rice cooked in bone broth has a delicious flavor. Bone broth and soups using homemade bone broth as a base are integral to diets that focus on healing your gut. The GAPS diet is probably one of the most popular diets to heal your gut. The gelatin found in homemade bone broth is very therapeutic to your intestines and encourages healing. If you’ve tried this homemade bone broth recipe or any other recipe on Cultured Palate please take a minute to rate the recipe and leave a comment letting me know how you liked it. I love hearing from you! You can also FOLLOW ME on PINTEREST, FACEBOOK, INSTAGRAM, YouTube and TWITTER. Nothing says health like homemade bone broth. You can't get anything close at the store. If using grass fed beef bones, roast the bones in the oven at 375 F for 1 hour. This enhances the flavor of the bones and gives a good flavor to the stock. Remove the bones from the oven and place in a stockpot. If using chicken bones, start here. Fill the pot with water - cover the bones. Add the vegetables - avoid Brussels sprouts, cabbage, broccoli, turnips as these tend to give a bitter flavor to the broth. Bring the water to a boil and add the vinegar. Turn the pot down to a simmer. Allow the broth to simmer for 24 - 48 hours or longer. See Notes for a continuous pot, Instant Pot and Crock Pot. As it cooks, add water as necessary and skim off any foam. When finished, strain the broth through a wire mesh and catch the broth in mason jars. Once cooled, the fat will rise to the top and the broth should gel like gelatin. The fat can be skimmed off and used for cooking or left in the broth. The broth will keep refrigerated for 1 week and can also be frozen for months. Use 2 lbs of bones per gallon of water. Follow the instructions but allow the broth to simmer constantly. Add more water as needed. Remove and replace the bones weekly with new ones. The bones begin to become very soft when it is time to replace them since the nutrients have been leached into the broth. Use directly from the stock pot for a delicious nourishing stock for soups or a simple cup of broth. Once the cooking is complete, press "Cancel" and then use the natural pressure release - you can also use the quick release method - either works. Place bones in the crock pot, fill with water, add vinegar cook on high until it boils, and then reduce it to low for 24 hours. Separate bones, strain broth and put into jars. Store in the fridge. 1. What is your favorite way to make bone broth – stock pot, slow cooker or roaster? 2. After it’s done, what is your favorite way to use homemade bone broth? I can handle this broth and the smell. I plan on looking for the sources for grass fed beef bones. Yummy!!! Can’t wait!! Thanks so much for the helpful hints. It helps taking the guess out of the work. Cathy, it really makes a big difference if you roast the bones first – in taste and especially smell. After we butchered our first steer, I tried making broth without roasting the bones first and, oh my goodness, it smelled terrible – no one wanted to eat it alone or as a soup base – I gave the whole pot to the dogs! Then, I tried roasting them at my daughter-in-law’s suggestion and there was all the difference in the world! Now we drink it plain if I haven’t made a soup with it! One thing I didn’t know when I first started making broth is that you can reuse the bones until they start to crumble. This really helps stretch your grocery budget especially when paying for grass fed bones. I usually add a couple fresh knuckle bones and a small amount of meat to each pot for flavor and gelatin. Gay, you are right, that really does help and it is so easy if you keep a pot simmering on the stove – just add more bones, water and veggies as needed. I’ve never made my own stock or broth before.. thanks for the idea, I definitely need to try this out! Thalia, I hope you try it – it is really easy! Would you recommend preparing this in a slow-cooker? It sounds like a great idea, but I am curious if anyone else has tried it and if it works as well. Thanks! Emily, I do it in the slow cooker also and it works great! Thank you for sharing this. I personally love drinking beef bone broth. I think that beef just have more taste and flavor over other bone broths. I’ve always wanted to make one myself but don’t have the time, which is why I got Au Bon Broth. I love it and its flavor, it’s a mix of chicken, turkey and beef bones. And it’s been helping me with my joint pains and sleeping issues. Cameron, thanks for the info. It is wonderful to have an alternative to homemade. I hope you will find the time to give it a try as it is very economical to make yourself! Try using a crock pot/slow cooker so you can just put it in and forget about it until it is done. Thanks so much for all the helpful tips, great recipe!